Team Wissmann | Running 26.2 miles in support of injured Marines. Running 26.2 miles in support of injured Marines. The Jeff Galloway program uses timed miles (called Magic Miles) to help runners predict appropriate time goals for a marathon. 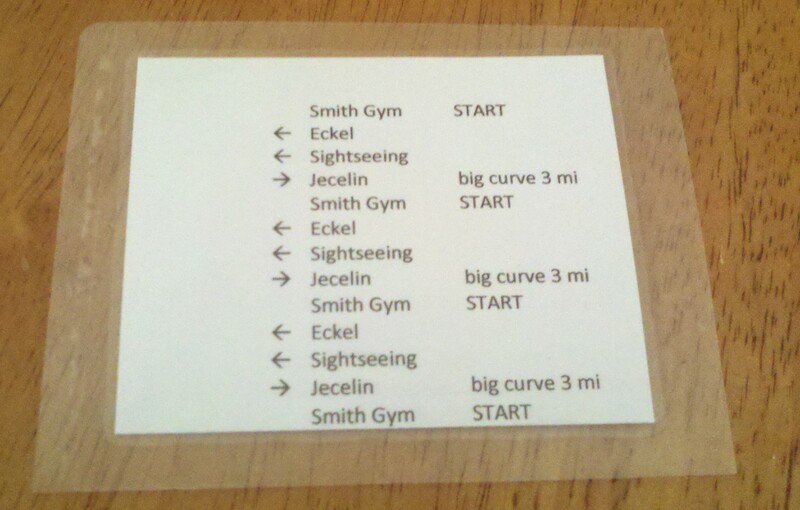 This is supposed to be the basis on which you choose your run/walk intervals. When I started the program, I didn’t have a current 1 mile time, so I chose a 3 min/1 min run/walk interval because it correlated with 10 minute miles, which sounded like the right pace based on my past running experience. I am still struggling with staying on top of my training schedule after moving. This morning I got a nice 5 miler in, and felt great. My pace was a little slower than I would have liked, but still OK. The weather was absolutely perfect, and I really enjoyed spending the hour outside. I’ve noticed that I’m feeling more stressed about completing my runs, and I hope I can go back to just enjoying them. I may not complete anything longer than 13 miles in these last 30 days prior to the marathon. The pain and struggle of that 20 miler kinda messed with my head, I think! While I love my New Balance Minimus Trail shoes, and have worn them for every run, the pain I experienced in my feet during my 20 mile training run convinced me that I need something with more cushioning to run on paved surfaces. I have no doubt the Minimus Trail would work great on long runs if the surface was more natural. Since I love the Minimus line, I’m ordering the Minimus Road from a local running store (love to support local businesses!). 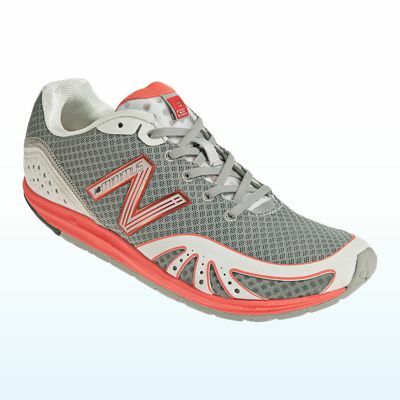 They should be here by next weekend for me to try out with 13-15 miles. I’ve also switched to a new pair of running capris since the 20 miler. The Stabilyx 3/4 tight from CW-X. These tights provide compression to reduce bounce and create support for the knee, low back and abs. In combo with the new shoes, these will hopefully help alleviate the knee aches that I’ve dealt with on some of my longer runs. So far they feel great! I missed doing a longer run last week – possibly not a bad idea after unexpectedly running 20? In any case, this week I’m back on schedule. For today’s run I visited another new venue – Cooper Creek Park. As you can see from the aerial view, there are tons of trees circling the lake. About 2/3 of one loop around the lake is fully or partially shaded. Pretty nice! I parked near one of the public restrooms, and planned out my route to make 3 loops around the lake so that’s I’d have two opportunities for pit stops. I ate an energy chew and drank some water each time I ended a loop. A seven mile run doesn’t necessarily require eating, or even drinking water (at least for me), but I want to keep in habit of doing it since I’ll be needing to do it on race day. Finding new places to run after a move is both good and bad. Good because new scenery definitely makes the time pass more quickly. Bad because it’s hard to “wing it” and feel confident you’ll still get the right number of miles or run at your target pace. Like this morning’s run being about a 1/4 mile shorter than I intended. We went out of town for Labor Day, and took the opportunity to go on a run in the cooler weather. 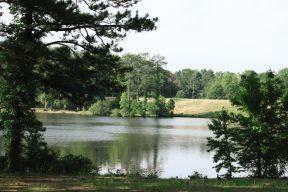 Wilmington Road Runners have a great “Places to Run” page where we found the Greenfield Park trail. We’re moving to the area in a few months, and I will definitely consider coming back here for a 13 miler. 3 times around with water fountains and clean bathrooms sounds good to me. Mentally, maintaining this faster pace, even for just over 40 minutes, felt even more difficult than finishing my 20 miler last week! I can definitely tell that I’ve been training for distance and not speed. Wow, what to say about this run — it was quite an adventure! Here are the details to start. I decided to push ahead with the 17 mile run on my schedule despite the soreness, and spent time on Tuesday planning and doing recon on my running route. This was my first long run since moving, and I decided that the safest location would be on base. Completing my longest run ever, in a brand new place, with different terrain, and extremely sore legs made for a very interesting mental state when I woke up on Wednesday morning. I was anxious, to say the least! Repeating the first 4 lines several times - not helpful. This glitch amped up my stress even more, but I decided to at least complete the first half of the route, which was a simple loop that I could easily remember after driving around it the day prior. While running the loop, I decided I would just run the loop twice to get my planned miles completed. Visualizing my original route in my head, I believed the loop was just under 9 miles, which would put me at just over 17 miles. The loop started and ended at the main gym on base, giving me a place to take a pit stop at the half-way point. In my original plan, I took a longer, indirect path going away from the gym, and a more direct path going back to the gym. Due to road construction, I ended up taking the indirect path out and back on the loop both times. This inflated my total mileage to 20.24 — 3 miles more than I had planned. Yikes! During my recon on Tuesday, part of my loop seemed like it would be very creepy early in the morning, and I was not looking forward to being out on that road alone before dawn. But to my surprise, a long section of the road is closed to traffic in the mornings, and there were hundreds of soldiers out doing morning PT spread out along a ~5 mile stretch. It was a huge relief to not have to be out there alone, and it was also very motivating seeing so many other people getting an early workout in. The biggest motivation came from several groups of Rangers — I know they had to be Rangers because no one else in the Army rucks carrying packs that big! 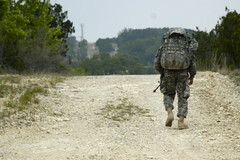 Nothing makes the 2 liters of water in your Camelbak feel lighter than seeing guys with ~150# packs. I’ve mentioned before that I seem to have lots of wildlife interaction on these marathon training runs. Just after starting out on this run I saw bats again – I never realized they were as active at dawn as they are at dusk! During my second time around the loop, I had a much more direct wildlife experience. I stepped on some kind of spiny plant, and one of the spines went through my shoe and sock and into my right foot. Ouch! It looked like a piece of a cactus, and the solid part had an irregular shape. The spines were 1-3 inches long and very pointy! 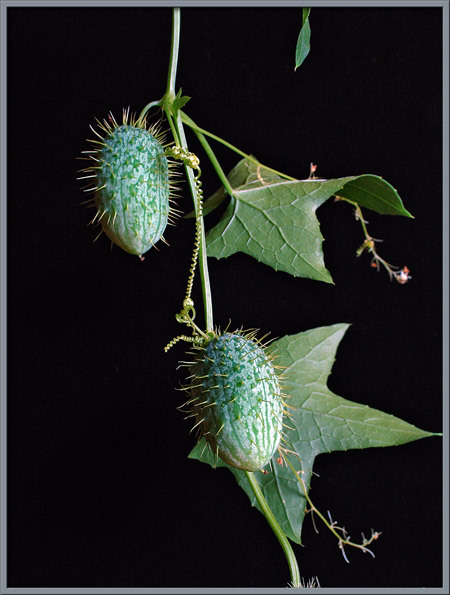 The closest thing Google showed me was the wild cucumber – pictured to the right – but the thing I stepped on had a much more irregular shape, and the spines were more varied in length. My schedule called for 7 miles this week, and it just so happened that the local running store, Big Dog Running, had an early AM 7 mile run that meets every Thursday. Perfect! The group was definitely much faster than me, but I was lucky that the group leader is a great guy who stayed at my pace for about 4 miles to show me the way. We ended up shaving off about 2 miles because we skipped a loop in two places, but at least I got the basics and a good 5 mile run. When I take out the 8-9 minutes worth of pit stops, my pace is still around 13:10 min/mile — right on target for a training run of this distance. Eating and drinking along the way for the first time made a huge difference in how I felt during this run. It did not make anything hurt less, but it did take away the feeling of total lethargy that has often been present in the last 30 minutes of my previous long runs. So it was more of a mental / muscular challenge to made my legs keep going, and not necessarily a lack of energy. Hard to describe, but basically, it was a positive change. There were many moments during this run when I started thinking about how far I still had to go. I was not feeling confident that I would make it, but at the same time there was no way I was going to stop! My legs, knees, feet, back and lungs are adapting — but I think my brain is adapting the most. Mentally moving runs of these distances from the “impossible” to “possible” category is a tough process, but so satisfying when you succeed. This was my first training run that was truly farther than I have ever run (or run/walked :)) before. I ran the Critz Tybee Run Half Marathon in February 2010 with very little in the way of training. I finished, barely, in 2 hours 20 minutes. My calves and quads were nearly non-functioning for several days. Not a good experience, but what can you expect if you don’t allow your body to adapt to something before you do it? That experience definitely made me nervous about marathon training, and is also one of the reasons I chose to follow the Jeff Galloway run/walk training program. I was amazed that I ran 7, 10, and then 12.5 miles (just shy of a half marathon’s 13.1 miles) with very minimal soreness. In fact, I was more sore from a 30 minute CrossFit workout I did last Saturday than I am from my 15 mile run! The human body is amazing! The route I planned included about 4.5 miles along the coastline of Amelia Island. While it can be a little monotonous, and there’s very little shade, there’s one thing I absolutely love about running on the beach road. 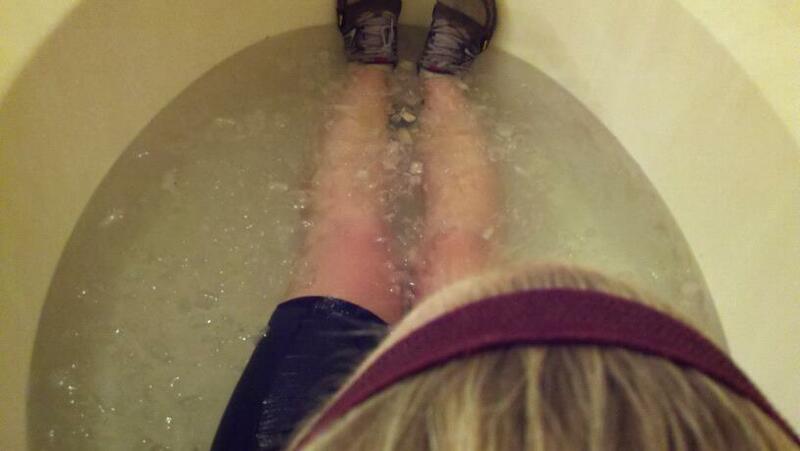 Finally, here’s a fun picture I took of my post-run ice bath. Very uncomfortable, but very effective! I left my shoes on because the worst part is having your toes feel like they’re frost-bitten! More about the shoes in another post – they are definitely not your typical long distance running shoe. On October 30th I will be running the 2011 Marine Corps Marathon in Washington, D.C. as a member of the Community Semper Fi Team. To reach my goal of raising $2,500 for the Semper Fi Fund, I need 125 people to donate just $20. Please visit my ActiveGiving fundraising page to donate online. Thank you!